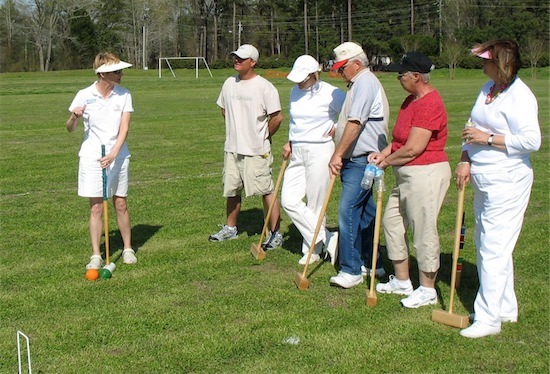 There’s a small but enthusiastic group of six-wicket croquet players in Washington, NC. They don’t have a dedicated court yet, and mainly play in neighboring Bath (which, like Washington, is a beautiful historic riverfront town). One of the Washington players is a student at UNC, and also plays at the Stoneridge Croquet Club in Chapel Hill. Through this connection, some of the Washington players visited Stoneridge in February. This group included Judy Jennette, the mayor of Washington and a very competitive player. On Sunday, April 5, four Stoneridge players paid a return visit. Andy Short, Eileen and Jeff Soo, and Tommy Harrington (who lives in nearby Greenville) met a group of twenty players at the McConnell Sports Complex for an afternoon of clinics. Four courts were laid out on a soccer field. Cutting standard dimensions in half proved to be just right for the turf conditions. The group was a mix of new and experienced players, so the clinic started with basic instruction in grip, stance, and swing. After some roquet practice all players moved into games of Golf Croquet. New players were then given an introduction to American Six-Wicket croquet, while the experienced group worked on tactics and break play. These players had mainly played a “cutthroat” version of American rules, so the tactics of playing with a partner ball were a new and interesting challenge. Efforts are underway to develop a higher-quality croquet court in Washington. Expect to hear more from this very promising group in the future.